The Caribbean Sea, like other tropical ocean regions, contains warm, clear water. The water is clear due to the absence of plankton and suspended particles. Plankton is the base of the food web in all oceans and, because there is little plankton in the tropics, tropical ocean water is nearly sterile in comparison with the fertile waters of the temperate oceans. This is in contrast to the popular misconception that tropical ocean regions are very high in biological productivity. In order for life to flourish in the harsh conditions of the nutrient-poor tropical seas, the creatures of the seas have evolved many methods to capture food. The most successful solution to the problem is the coral reef community. The reef is a living structure made by coral animals. 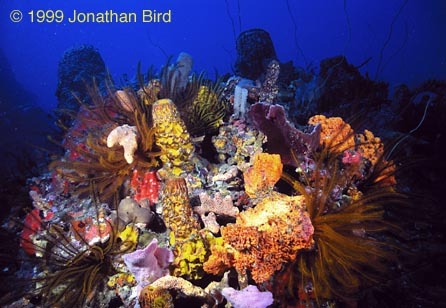 The reef itself is adapted to survive and grow in the tropical seas. As it grows, it provides a safe haven for fish and invertebrates to hide and make nests. This draws all kinds of life to the reef. The smaller fish draw larger fish and sharks. So the reef forms the basis of a complete ecosystem. "Beneath The Caribbean" shows the importance of the reef community and introduces viewers to many of the great number of unique and fascinating creatures (both large and small) which live on, around, or near the coral reef, including dolphins, manatees, eels, fish, turtles, and much more. Viewers will also learn about the coastal mangroves and their importance as a nursery for small fish. Featuring beautiful footage taken completely in the wild, viewers will witness the startling complexities of life in a tropical ocean ecosystem. The Caribbean Sea is full of beautiful coral reefs such as this. But what makes these reefs possible? 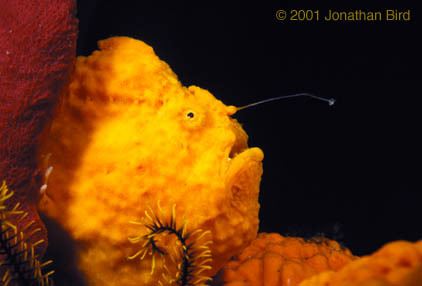 Viewers will meet many interesting creatures in Beneath the Caribbean, like this frogfish using its lure to fish. Beneath the Caribbean - Winner, 1997 CINDY Gold Award!